Teeth can go missing for any number of reasons, ranging from simple cavities to traumatic accidents, but what remains the same is that an incomplete smile is always a compromised one. Oral health, self-confidence, and basic function all diminish, which can take a significant toll on someone’s daily life if left untreated. However, at ProSmiles Dental & Orthodontics, our team is able to effectively replace any number of teeth using a variety of high-quality restorations. Each one is designed specifically for each patient, ensuring that the end result will not only look great but feel comfortable and be built to last as well. 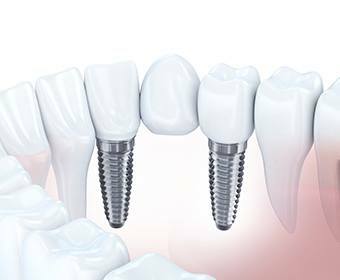 Why Choose Us for Tooth Replacement? While a single gap in the smile might be easy to ignore, especially if it’s toward the back of the mouth, the truth of the matter is that untreated tooth loss only tends to cause even more tooth loss. The exposed gum tissue is more likely to develop an infection, and the jawbone will slowly deteriorate and erode the base of the teeth surrounding the missing one, leading them to become loose and unstable. We recommend that our patients replace their missing teeth as soon as possible in order to avoid the pain and expense of dealing with these complications. Much like a bridge that connects a road over water, dental bridges close the gap left by one or more missing teeth by using an appliance that is anchored on either side. Two dental crowns are fitted over the teeth near the missing ones, and these are used to support up to four replacement teeth. 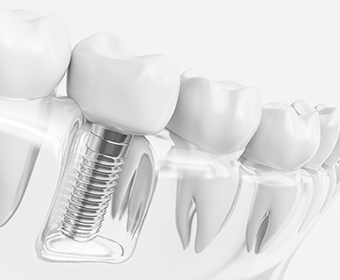 For patients interested in the most secure fit possible, they can also be paired with dental implants to deliver an even better and longer lasting result. Dentures enable us to replace several missing teeth all at once using a custom-made prosthetic. 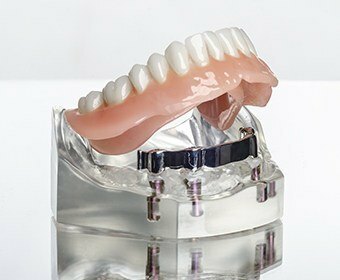 Fabricated using ceramic teeth and an acrylic gum-colored base, we’re able to shape a denture to each patient’s unique dentition to seamlessly fill any gaps or replace an entire arch if necessary. Patients will work closely with our team to find the perfect look and fit so that when they leave our office, they’ll do so with both their bite and confidence fully restored. Your teeth are extremely strong not only because of the hardness of their enamel but also because they are firmly rooted within your jawbone. When one goes missing, most replacements only restore the tooth above the gum line, which inherently makes them less stable than the real thing. 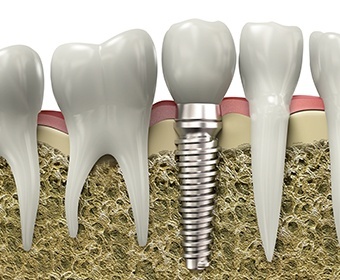 Dental implants, however, bring back the root below the gum line as well, and what you end up with is the next best thing to a natural tooth. With them, we can make it seem like a tooth was never missing in the first place. After a tooth goes missing, the jawbone in the area naturally starts to atrophy as the body resorbs nutrients from it. This can leave the area quite weak and unable to support any replacement teeth that a patient might want in the future. Bone grafting enables us to strengthen any area of the jaw we want, however, ensuring we’re able to safely and effectively rebuild a patient’s smile so that it lasts for decades to come.